We were greeted with outstanding views over the Sierra Nevada from our lofty campsite above Granada, but also chilly temperatures. Time to head to lower climes / climbs, which means heading west. Our first thought was Loja but a quick recce indicated that the best of the routes were either tricky, shady or a bit of a hike. 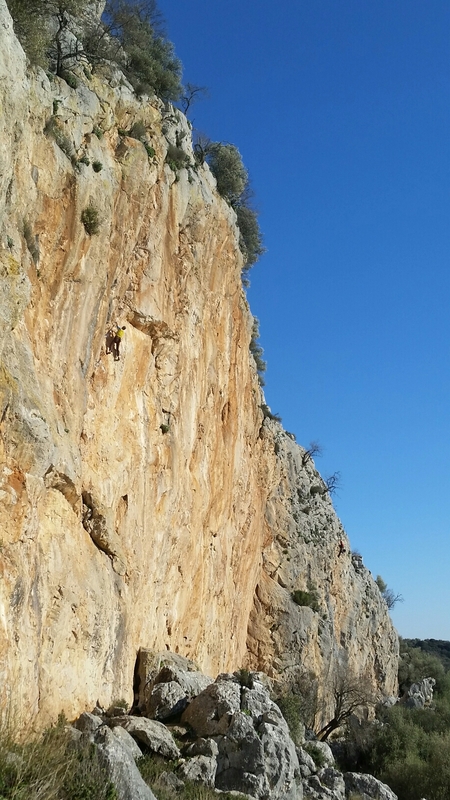 Plan B – push on to El Chorro, with a stop off at Yugoslavia. 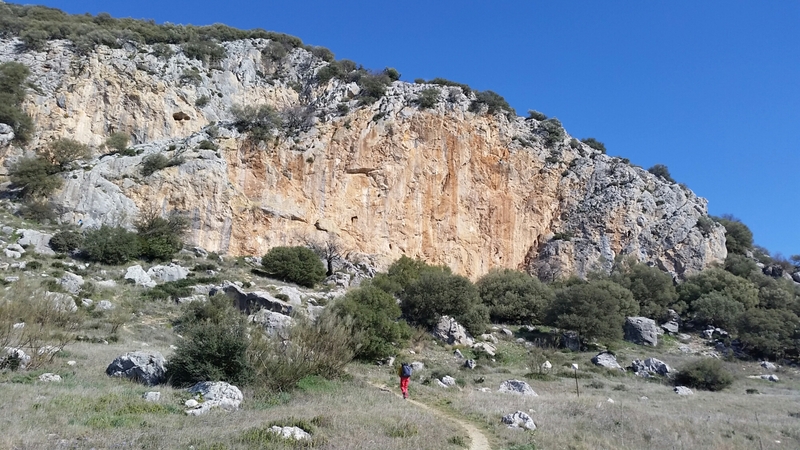 Not a Balkan diversion, but an oddly named crag at Villanueva de Cauche. As you approach, a broad limestone ridge dominates the horizon, but looks to crumbly to be a crag – turn the corner and all is revealed: some geological event has sliced the end off the ridge to make a stunning crag. Unfortunately, it overhangs by about 10 degrees across the central orange wall, leaving any routes in the 6s shoved to the grey wings at either end – and these aren’t the best quality, and are pretty tough for the grade. Everything on the centrepiece is 7c / 8a and up, apart from the magnificent line of Diedra Candela, 7a+, which follows an overhanging groove for the full height of the crag – not surprising it warrants ‘top 50’ status in the guide. The first 10m can be done as an unlikely 6b+, hideously polished overhanging boulder problem to start then a slippery slab on a sharp mono. Horrible! I grabbed a clip on my first go, for fear of slipping and losing a finger. Logic suggested that if I couldn’t even manage the 6b+ I shouldn’t bother with the remaining 20m of the 7a+, but I plugged on and got the rest pretty much first go, bar an anxious clip on slippery footholds. Sustained tricky moves with the occasional rest offered by bridging the groove. Just my kind of thing. I pulled the rope and had another go – through the nasty start this time, and I sensed I could make it to the top – correctly, as it turned out. I seem to have turned into a red-pointing sports climber! 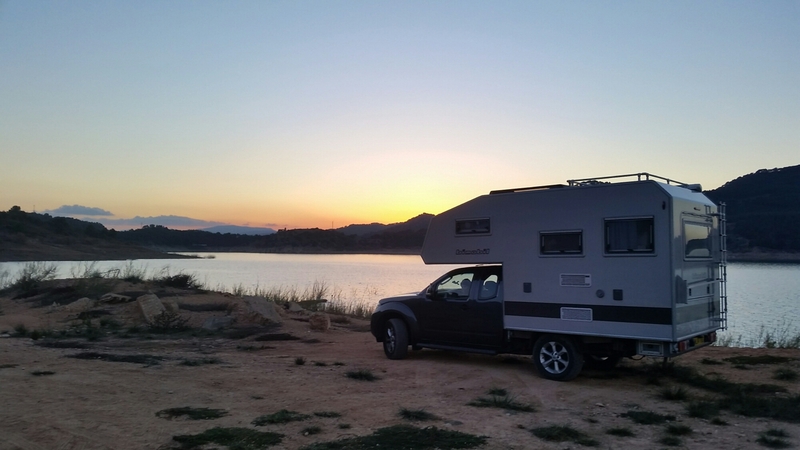 Pressing on towards El Chorro, we park up for the night at the reservoirs near Desplomlandia, just as the sun sets. 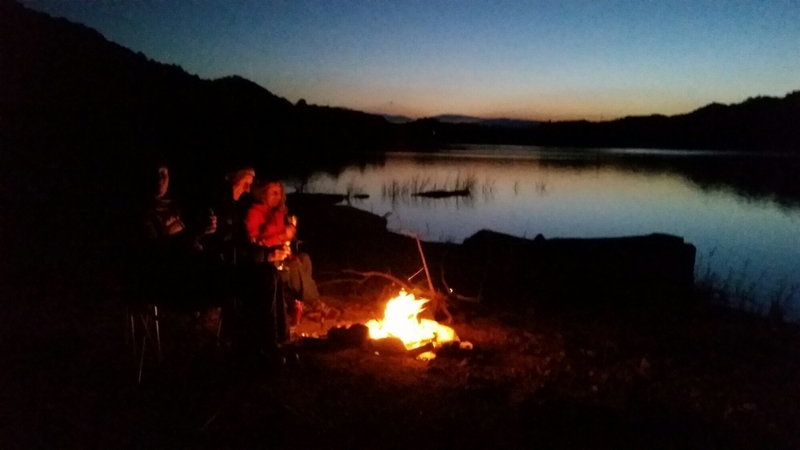 A few dead olive bushes and driftwood provide enough fuel for a fire, the wind has dropped so it is warm enough to sit out and watch the night explode with stars.